FujiFilm will launch a digital camera capable of shooting 3-D images and video in Europe next month, expanding availability for the camera that has only been available in Japan until now. The camera made FujiFilm the first major camera maker to offer a consumer product in the emerging 3-D imaging market. It’s also the first consumer electronics maker to present a ready-for-market 3-D device at this year’s IFA electronics fair in Berlin. The first few hours of the show have been filled with talk about the potential for 3-D technology but most of it has centered on unseen products that will be launched next year. FujiFilm’s Finepix Real 3D W1 will go on sale in Europe in October and cost €499 (US$712). It was launched last month in Japan where it costs around ¥50,000 (US$542) and will shortly go on sale in the U.S. The camera has two lenses and two 10-megapixel image sensors. When the shutter button is pushed each takes an almost identical image and the camera then melds the images together to produce a 3-D image. 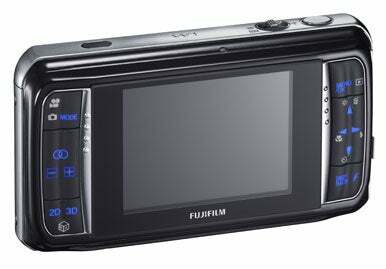 The 3-D images can be seen on the camera's built-in 2.8-inch LCD screen or through an 8-inch LCD photo frame that FujiFilm will also launch in October. The Real 3D V1 digital photo frame will cost €349. The two screens use a parallax barrier system to direct light from each of the two images to the respective right and left eye of the viewer so the image on the screen appears to have depth to it. The method has the advantage of not requiring the user to wear special glasses but the image can be difficult to see at an angle.